It finally seems like all the good guys are on the same page entering the back half of Daredevil’s third season. Ray and Matt have set their sights on the FBI while Foggy’s latest discovery could lead to another legal fight with Fisk. The only outstanding party is Karen. The plan just might hinge on whether she can hold herself together. Those plans will have to wait, as the episode opens with Dex trying to restore order through therapy and household chores after the Bulletin attack. 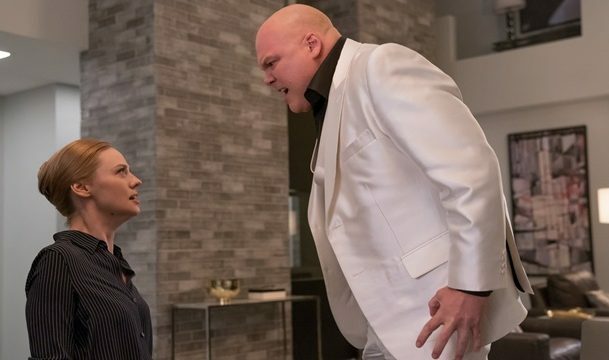 His attempts to reestablish the pillars of order Fisk pulled out from under him lead him to track down Julie again. He convinces her to have coffee with him so he can explain his actions. He claims his stalking of her wasn’t romantically motivated, but rather a need for positive influences in his life. The loss of structure in his life due to Fisk’s manipulation clearly weighs on him. He begs her to help him, treating him like a caller at the suicide hotline where they previously worked. Julie agrees, but the reunion is short-lived as Fisk has Julie killed shortly thereafter. Posing as Julie, Fisk cuts off ties with Dex, leaving him without a support system once again. Foggy’s eureka moment gets explained during a meeting with Karen. Documents he found in Marci’s case briefs point to Fisk’s ultimate goal of positioning himself as a broker for government protection to the city’s underbelly and corrupt officials. Karen seems resistant due in part to her emotional crisis, but the two see an opportunity to entrap Fisk in the terms of his transfer agreement. Foggy’s plan is to make the claims against Fisk publicly with Karen present to write an article. Unfortunately that won’t work because Karen lost her job. 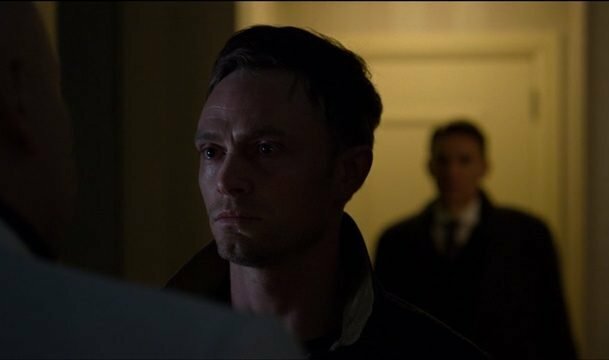 Foggy pleads with her take the information to Ellison anyways, seeing as he wants to take down Fisk as well. Foggy’s part of the plan goes off without a hitch. He delivers a passionate speech in front of DA Tower and the Hell’s Kitchen Club, outlining his claims against Fisk and discrediting Tower’s efforts in office. Foggy’s big finale comes to a screeching halt when he realizes that Karen isn’t there. Karen skips the Hell’s Kitchen Club dinner and chooses to confront Fisk herself rather than deliver Foggy’s evidence to Ellison. She earns an audience with the man himself in his penthouse cell that immediately turns tense. Fisk is surprised to see her face-to-face after Ben Urich’s murder. She clearly didn’t understand the final lesson he tried to teach her. 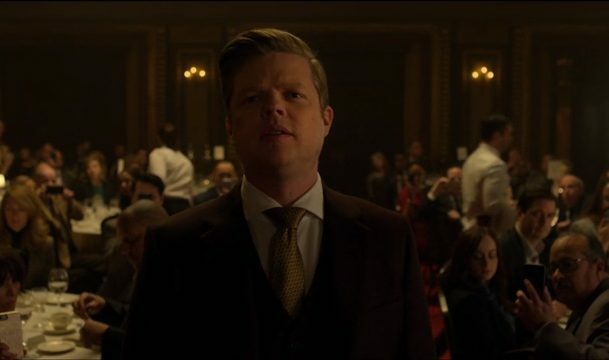 Fisk immediately becomes curious about Karen’s relationship to Matt and his secret life after Karen threatens him with the knowledge of his father’s murder. All he needs is the look of shock on Karen’s face to confirm his belief that Matt is Daredevil. Convinced that she just inaudibly betrayed her close friend, Karen brings up James Wesley. She further provokes Fisk, dredging up his feelings of abandonment after Wesley’s disappearance. As Fisk grows visibly more angry, Karen reveals that she not only murdered Wesley but shot him seven times, making sure the clip was empty. The FBI storm in with Foggy bringing up the rear before Fisk can respond. Foggy questions Karen’s plan as they make their way out of the hotel. Karen might have been willing to provoke Fisk to attack her, but now she’ll have an “army shooting back” at her. Ray’s investigation into his fellow FBI agents quickly leads him to consider Dex the prime suspect. He sets Dex up with a lawyer, paid for by his fellow agents’ donations, to fight his suspension. The meeting is nothing more than a distraction to allow Ray and Matt to investigate Dex’s apartment. Matt and Ray canvas the place, even cracking open his closet safe, but find no evidence linking Dex to the Bulletin attack. Matt isn’t swayed though, as he can smell the suit within the apartment. The suit has been moved, but Matt finds Dex’s therapy session tapes. Listening to one confirms Dex’s psychotic nature to both men, but their search is cut short when Dex returns home. The two manage to escape, but Dex spots them and begins ricocheting bullets toward them. Ray catches one in the side, but both are able to get away when the NYPD show up. 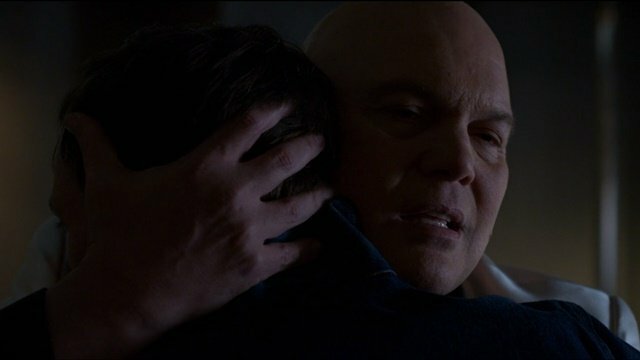 Dex burns the rest of his session tapes and embraces Fisk as his new North Star. Matt is surprised by the similarities between his and Dex’s childhood, though the two had diametrically different outcomes. That fact immediately leaves his mind when he overhears Maggie praying for divine aid for Matt. Divinity gives way to pleading with the dead when Maggie pleads with Jack’s spirit to help their son. Matt stops dead in his tracks at the revelation that Maggie is his mother. 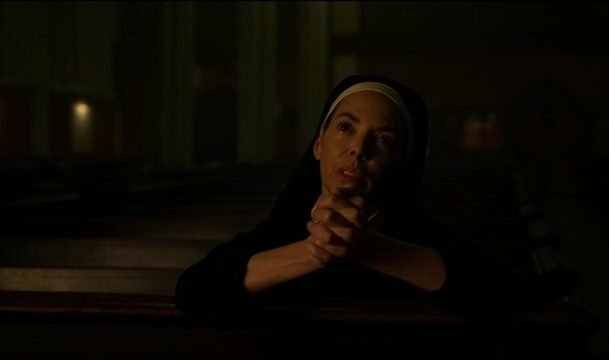 What do you think about Daredevil season 3 episode 8? Let us know in the comment section below!